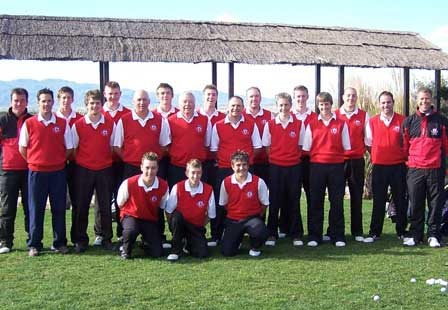 To find out more about Devon County Golf Union click on the logo. not least, Steve for the wonderful food we had all week. swimming pool, and I have asked him to contact you so that you can show him the facilities. This is our second time of visiting Desert Springs for our warm weather coaching. On both occasions the weather has been superb allowing a full weeks training. The practice facilities cater for all our needs, with an excellent short game set up. While the tight par 71 course was in very good condition it provided an excellent test for our Devon County Golf Team to sharpen up their skills prior to the start of the season. The in house staff gave us excellent service with the chef producing very tasty lunches for the entire week. Just a few lines to thank you and all your staff for looking after us so well last week – it was considered to be a great success, a lot of that down to your team who made us so welcome and put up with all out alterations to plan with such a nice smile. We very much hope to repeat the trip next year. We wish you all a very successful 2005 – very many racks.